Condiments rule (after hot sauces, of course), and today for Day 5 of Week of Mild, we’re looking at Dillapeño Salsa & Relish from the Smither Family Kitchen in Texas. 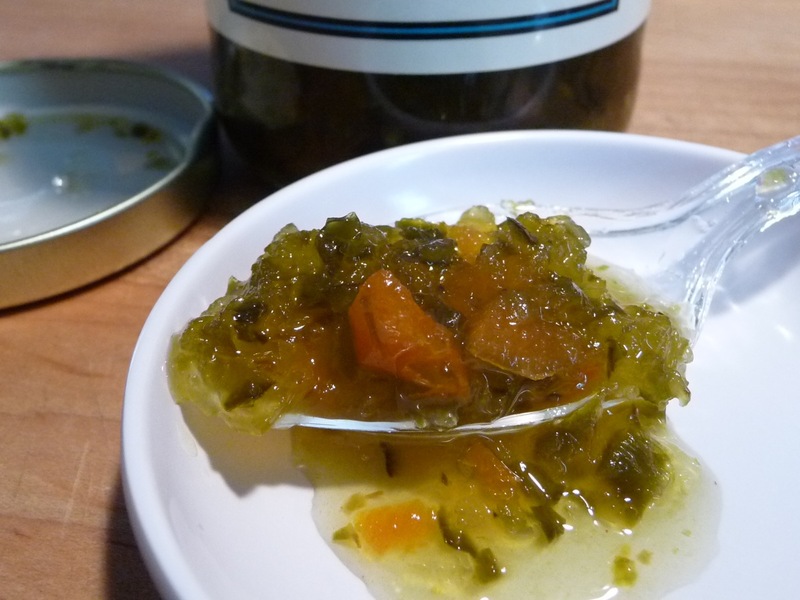 This concoction of cucumber, jalapeños, sugar and carrots makes for a delicious condiment. Sweet and only mildly hot via the jalapeños, it’s perfect on “cream cheese, deviled eggs, hot dogs, burgers, tuna salad… and our favorite, chips!” according to their label. Texture & Appearance: It’s chunky in a relish kind of way. Ok, let’s cut to the chase – it IS a relish. A very sweet relish, with jalapeños. Taste Straight Up: But this is not a sweet pickle relish… there is a dill flavor to the cucumbers in the mix, hence the name “Dillapeño”, even though there’s no dill listed in the ingredients. We’ll assume it’s in the spices. The jalapeños have a mild kick to them, and above all, it’s very sweet. Personally, I love sweet with heat, and this stuff is ok by me! Heat Level: – The sharp tingle you get from a good green jalapeño pepper is very much there, but the sweetness dominates, and the dill mediates. One star is pushing it folks. This is a mild heat at the upper end of “1 star”. Label/Graphics: A simple yet classy label adorns the 13.5 ounce jar (kind of a jelly jar or … um… relish jar), with the word “Dillapeño” as the boldest text. You know what you are buying here. Proudly proclaiming (and rightly so) “Homemade in Texas – Salsa & Relish” against a faded outline of the State of Texas (should that be capitalized?) this Smither Family Kitchen product is a top shelf condiment. 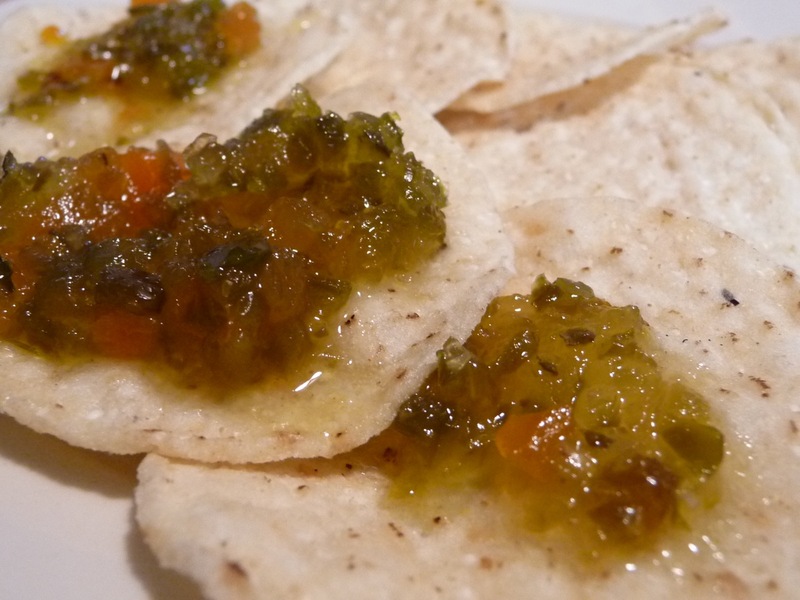 Overall Rating (Taste on Food, Final Thoughts): – I’ve had this relish/salsa on a few foods before this review. 1. On pizza – not recommended… just doesn’t work with the cucumbers and dill and all. 2. On an all beef hot dog – remarkably good with ketchup. Yes, ketchup on a hot dog. I know I’m not 6 years old and therefore ketchup should never come near my hot dog, but it bested yellow mustard as the companion for this test. By itself it was fine too, but the ketchup added a sort of Sabrett’s NYC Hot Dog Stand flavor profile. And it beat anything 7-Eleven offered. (Sorry Pinterest, I have no pics… it was a hot dog). 3. On tortilla chips – I assume that’s what the label referred to when it said “… and [on] our favorite, chips!”. Surprisingly good my friends! While it seems barbaric to eat a relish on tortilla chips, when there’s perfectly good salsa sitting in your pantry, this was actually pretty freakin’ good! My apologies for not having tried it on nachos yet, but I can tell it would be great and quite different. I could see keeping a case of Dillapeño on hand for the classic “pour-over-cream-cheese-and-serve-with-crackers” appetizer all of us lazy folks bring to the upcoming gridiron parties and football “soirées”. Different than your usual thick “pepper-jelly-over-cream-cheese-and-serve-with-crackers” fare, it just might make you the talk of the soirée! And maybe Joe Flacco will make some completions this year. Oops! Wrong forum. Be sure to visit “Mom, Ashely, Paige and John Kerr” at SmitherFamilyKitchen.com for Dillapeño Salsa & Relish and all of their other Texas goodies, and tell ’em HotSauceDaily.com sent you! Dillapeno will surprise you with the variety of foods you can put it on. Great review! Thanks Austin! Can’t wait to see what Smither Family comes up with next! Of all the cool things this would work on, the first thought I had was using it to make a twisted tzatziki sauce for gyros. Yum! This product has become one of our best sellers!! We sample it daily and folks just rave about. Must say it is habit forming!! You can stop by our storefront at 1003 South Austin Avenue, Georgetown, Texas (512-863-3411) or order from our website, http://www.wonderfulthingsonline.net. We love our Texas food creations!! Hey, thank you Sharon. Always good to know of places to order from!